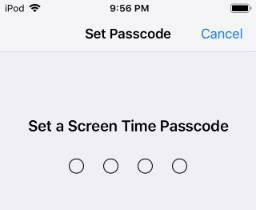 iOS 12: What is Screen Time passcode in iPhone/iPad and how to turn it off ? iPhone X,8,7,6 user are facing issue after upgrading to iOS 12 they have never setup screen time passcode, yet it is enabled after they the upgrade to iOS 12. And it seem to be a 4 digit password when iPhone turns on with iOS 12. Normal iPhone lock password is six digit but this Screen Time Passcode is 4 digits only. 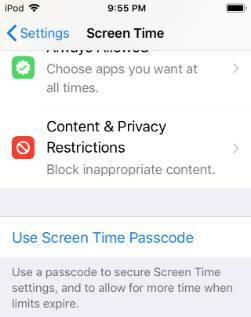 This passcode is separate to a lock screen passcode and iPhone user is not able to understand what this Screen Time Passcode means. But if they try to remove some feature like Clock from the home screen the Screen Time Passcode restricts the actions. This seems to be a new behavior as the in iOS 11 the Screen Time passcode was never there. If you are using the your phone too much and want to control the use and have stats of iPhone app wise usage along with alert. With Screen time feature in iOS 12 iPhone or iPad will remind you that you’ve used an app for X hours (you can set the limit) per day. It is just a warning message to put down the phone and do other stuff. This feature is called Screen Time and it’s fairly easy to use. If you ever had a passcode for Restrictions in iOS 11/10 then that passcode is now set up as Screen Time passcode in iOS 12. Many iPhone user don't remember setting a Restrictions passcode especially if they have set it up accidently while just playing around with what options the Restrictions had and then never went into them again. One way to remove the Screen Time passcode is to erase the device and set it up as new. (Setting-General-Reset->reset as new). Please ensure to take backup before resetting the iPhone/iPad. Please note that reset will make iPhone to again load with the iOS 12 even though the backup was from before that. Setting it up as new prevents all hassles. In case you do not want to go in resetting the device please go to next fix. Other way is to remove the restriction passcode from setting in iOS 11 itself and then take iPhone backup. Now upgrade to iOS 12. Now load the back up to iPhone and you shouldn't have any problems upgrading to iOS 12 on the iPhone ad iPad and there won't be a passcode for Screen Time as you have removed the screen passcode.